jlfong1988 I think sembcorp, kepcorp and sembmar are worth looking at :) These are fundamentally strong companies. Biosensors is highly regarded by many analysts. interface Golden Agri not so fast. Will drop some more between 0.61 to 0.62 and stabilize until after CNY. petechowkw Will Golden Agr drop below 0.620? interface No reason for it to be at today's price. I will wait for 0.61 which me thinks is very reasonable. petechowkw Expecting AmResearch to release their research article/news as it did in the Borneo Times of 30 Jan 2013.
petechowkw @ interface : Believe you have bought Golden Agr which is now even better than what you last waited for(0.61). benson911 Wow...keep dropping....should average down? sengchai Sometime drop n sometime up dun worried .limited is there.enough already time to move.be happy. gtisylvia88 this is gd investment. PungTM Still droping...buy somemore to balance? looliatliang hi Pung. better not do that. petechowkw This counter is going up now. petechowkw Short sellers came out in big herds to sell down GAR today (31 July 2013). ycf128 expect poor results to be reported after market closed today. deepvk is it good to long or short this one? bcshee anyone know why this stock is languishing at this level of 54 to 56 cents? ekomuwa Golden agri now at cross road, sideway a bit around 0.585 - 0.59 these few days, the future crude palm oil saw a potential price increases; http://www.palmoilhq.com/crudepalm-oil-cpo-futures/, what fundamental suggested is a uptrend potential....so the stock price logically will go up??? ekomuwa Technically, since 17 mar, this stock formed a nice ascending triangle with resistence at 0.59, there was a small gap between o.59 & 0.595. Will this gap be close soon??? ekomuwa will this stock challenge the next resistence at 0.61????? ekomuwa This stock touched 0.615 a total of 12 times since mid-Nov 2013 till 23 Jun 2014, however, failed to break through this resistance level. It broken it's strong support at 0.57 on 20th Jun 2014.....it was closed 0.56 on 23 Jun 2014, is this stock moving toward 0.505 in mid-term? Anyone care to share?? ekomuwa Moved between 057 and 0.56 on 24 Jun and closed at 0.565 with 16.67 M traded, look like this stock trying to break the resistance a 0.57 to enter back range zone of 0.57 & 0.615. However, I viewed this as the tactics for those already trapped and trying to close their buying positions on rebound. Mid term wise, I am looking at this stock may trend down towards 0.505. Anyone have other comment/view point? please share!! Thank! ekomuwa I read from The wall street Journal on 23 Jun 2014, it summarized the outlook for palm oil as "The outlook isn’t very encouraging for palm oil exporters. Some market analysts expect higher prices ahead, lasting well into 2015, further crimping sales, due to dry weather expected in coming weeks and months brought by the El Nino weather system". Will Golden Agri get affected? Should I TP now and buy later???? ekomuwa Oop, here is the link...http://blogs.wsj.com/moneybeat/2014/06/23/ramadan-unusually-not-good-news-for-palm-oil-sellers/. Invest / Trade with care.....!! Any Doji candle by definition has the close at or near the close price. Gravestone Dojis have a high wick reflecting a rally during the days trading. Candlestick traders will watch the following day to see if buyers are able to take control of the market trend. When day-threes price holds above the Greavestone Doji, it suggests that short positions may cover their exposure, closing out their sell positions and leading to the weakening of the bear market. Many bottom pickers will start buying once that occurs, leading to a bullish reversal." ekomuwa With the STI gained 21 point at 3264, I saw Golden Agri had some buying interest on 2 July, opened at 0.545, and closed at 0.55 with 27.2M changed handed. 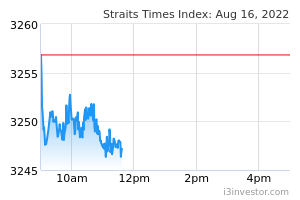 We shall wait and see how market move today...The US non-farm payroll due to release on Thursday (US Times; which will be around night time in Sg have a positive note from the market. So come Friday STI will react positively or not??? Will this help lift Golden Agri this Friday too??? ekomuwa A piece of news might had fueled the price to head north these few days...." Golden Agri-Resources (GAR) proposed the collaboration with Louis Dreyfus Armateurs Group (LDA) through a 50:50 equity participation in Orchard Maritime Services (OMS), a subsidiary of LDA. OMS currently operates a fleet of modern vessels capable of transporting various agricultural and mineral commodities as well as GAR’s cargoes. The joint ownership of OMS will create a reliable and efficient maritime transportation network in Indonesia." This stock opened 0.55, reached a high 0.555 and closed there on 3 July 2014 with 19.19M changed hands. Overall STI should be good today as the US non-farm payroll was good yesterday "A strong jobs report Thursday was enough to push the Dow Industrials to their first close above 17,000 in holiday-shortened trading. Here’s the recap of the day’s record activity. Also see a compact rundown of the day’s trading activity in Market Snapshot." With this, are we expecting this stock will go further north today??? ekomuwa On last Friday (4 July 2014), saw this stock with increased volume to 29.43M changed hands. There was heavy buying around 0.55 and 0.555. This sock opened at 0.555, ever went down to 0.545 and ever shoot up to 0.56, closed at 0.55. Personally, I felt many buyers entered their positions already, should see more support this week, however, resistance level shoud around 0.565~0.57....When world cup going to end by next early or mid week, activity should back to stock market....trade/invest prudently. ekomuwa More news on Golden Agri strategic move..." http://seashipnews.com/News/Golden-Agri-Resources-and-Louis-Dreyfus-Armateurs-join-forces-in-Indonesia/3w3c2361.html". ekomuwa Golden opened at 0.555, hovering around the price range of 0.55 and 0.56 on 8 July 2014 with 11.3M changed handed. look like the price positions at 0.50 and 0.555 found resistance as well support with reduce vol trade. The market sentiment is a cautious one, majority of the players are looking for direction now. From a fundamental analysis point of the CEO of golden agri said this in its Q1 2014 press release. ekomuwa Heavy selling was evidence yesterday for golden agri as the stock dropped 1 cent from 0.555 to 0.545 with 33.45M changed, I noticed there was a increasing trading vol since Monday. There was some effort to push the price up to a high of 0.56. However, seller out number buyer and pushed it down to 0.545 and closed there when the market closed. Will today see buying interest back to support this stock????? ekomuwa opened 0.555, closed 0.56 with 21.36M changed hands, it touched the resistance line formed by the downward channel (too bad I can't attach its chart for viewing). Be careful for those who want to take a long position. Base on TA, my assessment is that if Golden Agri unable to break up at hold well above 0.56, this stock shall retract toward 0.51 ~ 0.52 region. Do your homework, trade and invest prudently...! ekomuwa at cross road now...short term may challenge 0.56, but mid term should go down to 0.505....any comment?? wlun85 FROM 60cents to 51cents.. any comment>? ekomuwa Next support at 0.505, this stock may at range trading now between 0.505 and 0.57. If 0.505 is a strong support, this stock may rebounce up for short term. Just based on TA analysis. Do your homework and invest/trade prudently. Tutuk rotational play. commodities stocks' turn? Tutuk anyone followed Stamford Tyres? earnings up ovet 200%. and 1/4 of private cars in Singapore driving for Ube Grab. possibly huge cycle ahead for Stamford?